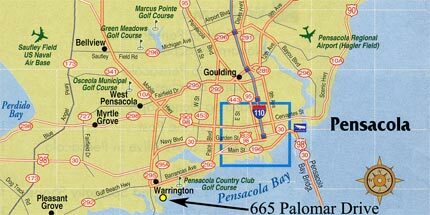 Pensacola, FL is tucked safely behind a beautiful barrier island on the Gulf of Mexico, located on the southern shore of Pensacola Bay. 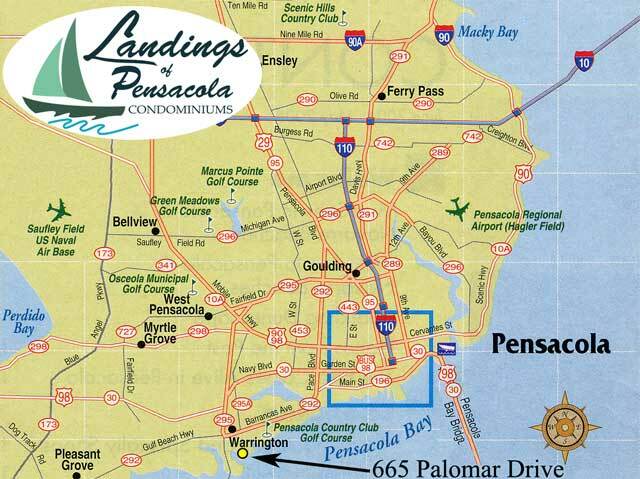 Pensacola is convenient to several locations throughout the Southeast. The majority of travelers enter via Interstate 10 which connects to Pensacola via I-110. For a slower-pace route, US highways 90 and 98 also pass through from east to west. US route 29 provides north-south access. Many visitors enter Florida from Alabama through Perdido Key on SR 292. Scenic US 90 heads northeast from Pensacola toward Tallahassee and is designated as an official Florida scenic highway. The bluffs are of bright red clay and offer a panoramic view of Escambia Bay. The Pensacola geography is only matched by its beautiful weather. The average temperature is 67.7 degrees.